Construction sites are constantly at a high risk for theft and other security issues. Heavy equipment left out and unguarded can pose an opportunity for security breaches and open companies up to the possibility of theft. However, construction sites aren’t the only ones at risk. Recently, mining sites around the country have been experiencing thefts and security issues too. And just like construction sites, these crimes can be costly and dangerous. 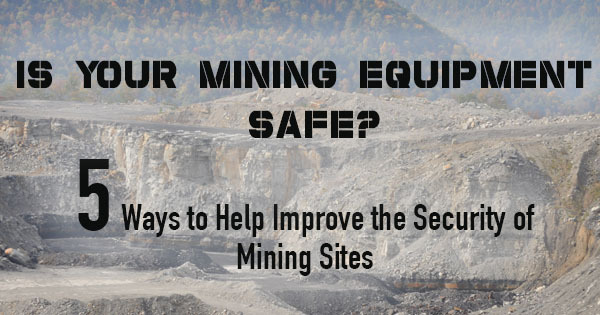 Here are five ways to start improving mining site security. An environmental database application contains all of the local and national regulations with which a mine operator must comply and can be a useful tool in improving mining site security. Key users can establish, assign, and monitor workflows from the system designed to control some hazards and comply with regulations. Perhaps the most important aspect of mining security is the safety and wellness of the employees working. Effective risk management will assess potential risks, such as areas that need to be well-lit with portable light towers, and track the site’s progress through safety and security modifications. If an employee fails to pass certain health and safety requirements, such as alcohol or drug tests, then they could be a threat not only to themselves, but to the security of a mining site. A thorough health and safety program evaluates and tracks the needs of employees and will provide scheduled progress reports in the event that something is amiss. It goes without saying that mining equipment is one of the most valuable aspects of a mining site. Without the required level I illumination for nighttime construction sites and mining sites working in dark areas, the safety of employees and security of mining equipment could be at risk. One of the best ways to enhance the security of a mining site is by keeping it properly lit at all times. Already, portable trailer lights and LED light towers are being used in border security efforts. By providing adequate levels of illumination, criminals can no longer operate in darkness. The same holds true with any hazardous area, whether you’re providing enhanced border security or trying to protect your mining operation. Good, quality LED bulbs can last upwards of 25,000 hours, making worksite security simple and long-lasting. There are approximately 7.8 million production workers in the United States construction industry, but they can’t keep your mining site safe for you. That’s up to you, and with these five tips, adequate lighting and border security should be simple to achieve.